L string = 416 mm, L pendant = 27 mm, W pendant = 21.8 mm, th pendant = 5.2 mm; diam bead = 2 mm, th bead = 1 mm [RTS 29/6/2004]. Collected by Percy Horace Gordon Powell-Cotton and his wife Hannah on 3rd May 1933 during a shooting expedition. Light brown twisted plant fibre cord onto which have been strung just over 1200 small glass ring shaped beads with convex sides, with the cord tied at the top with a small knot. The majority of beads are a light blue colour (Pantone 304C), but there is also a small group of 3 slightly translucent red glass beads (Pantone 1807C). The cord has been doubled over and worn as two loops, with an ivory pendant suspended from the centre of the base (Pantone 155C). The pendant has an irregularly flat back and a convex upper face, and is sub rectangular in plan view. It has been pierced with a small circular hole near the centre of the top edge; a small plant fibre loop fastened through this hole attaches the pendant to the beaded string. The surface of the pendant is highly polished. The necklet is complete and intact. It has a total length (as strung) of 416 mm including the pendant, and 388 mm without. The pendant is 27 mm long, 21.8 mm wide and 5.2 mm thick; the hole through its top has a diameter of 1.5 mm. The beads are of similar dimensions, with a typical example measuring 2 mm in diameter and being 1 mm thick; the cord is around 0.5 mm in diameter. The necklet has a weight of 17.3 grams. The blue beads are said to be trade beads; the Dinka call this object talang A ccording to Domville Fife, who was writing in the 1920's, the manufacture of bead necklaces was done by women amongst the Agar Dinka: "bead necklace making is also a profession which is represented in almost every large village, but as this requires the outlay of cattle or other native produce in order to obtain the beads from the few Arab traders who penetrate into these regions, it is often the occupation of the daughter of a chief" (C.W. Domville Fife, 1927, Savage Life in the Black Sudan, p. 137). Accession Book Entry [p. 248] 1934 [insert] 8 [end insert] - MAJOR P. H. G. POWELL-COTTON , Quex Park, Birchington, E. Kent. Specimens collected by himself & Mrs Cotton, during hunting trips, 1933, viz: - From the DINKA tribe, FANAMWEIR & KORNUK, WHITE NILE [...] [p. 250] [insert] 25 [end insert] - Talang , necklet of blue trade beads with ivory pendant, ib[idem] [FANAMWEIR] (2233). Additional Accession Book Entry [p. 249] - 1934.8.25 No given AP [red biro] A20 F12 3. Related Documents File - Typewritten List of "Curios Presented to Dr. Balfour by Major & Mrs. Powell-Cotton. Dinka Tribe". 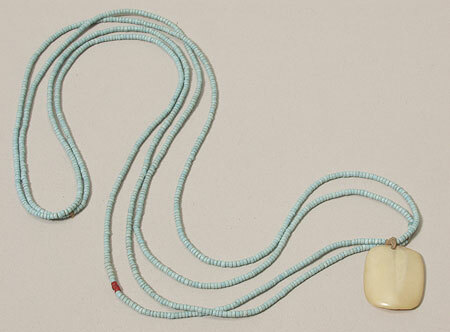 This object appears as item 2233: "Necklet, blue beads, ivory charm, native name Talang , 3/5/33 Fanamweir, 8.55 N, 28.42 E". Also contains details of a cine film 'some tribes of the Southern Sudan', taken by Powell-Cotton during this 1933 expedition, copies of which are now in the National Film and Television Archive and the Powell-Cotton Museum in Kent [RTS 14/3/2005]. Old Pitt Rivers Museum label - Necklet with amulet, Talang , DINKA, FANAMWEIR, E. SUDAN. d.d. Major Powell-Cotton, 1934 [front], 8° 55' N, 28° 52 [sic] E. 1934.8.25 (2233) [back; label not kept with object]. Current display label - SUDAN, BAHR EL JEBEL; DINKA. Neck ornament, talang, of blue trade beads with ivory pendant. Collected in 1933 and donated by Major P.H.G. Powell-Cotton. 1934.8.25 [in case U.26.A; RTS 28/6/2004]. Sparks, Rachael. "Dinka necklet" Southern Sudan Project (in development). 03 Jan. 2006. Pitt Rivers Museum. <http://southernsudan.prm.ox.ac.uk/details/1934.8.25/>.